While I was working for Domani Studios, I was tasked with an odd request. Make a website primarily for an iPad. Having an iPad first objective was quite interesting. Desktop version comes second? It shows how the consumer market is going more and more towards mobile. 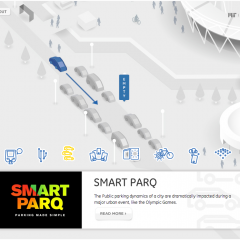 This site was to show off different exhibits in the London Games Olympic Village. The project was extremely fun building it and crossing the hurdles of optimizing for mobile along with the normal cross browser compliance.